If you are a student of A Course In Miracles, you learn early on or you don't progress ~ It takes great courage to turn your life over to Your Higher Power because it's one terrific 'E-Ticket Ride'...藍...that's how you find Your Freedom. "Fear is the cheapest room in the house. Our Spiritual Leader, Sheila Johnson, introduces her new "Connection in Unity' ministry with "Foundations Course Part 1" of The Connection Practice ® on May 17 & 18. This introductory 12 hour ​course will be presented at Unity of Stockton on Friday, May 17 from 6-10 PM and Saturday, May 18 from 10 AM to 6 PM. Sign up by May 1st for the reduced price of $149. On Sunday, January 6, we celebrated my favorite event at Unity of Stockton ~ our annual White Stone Ceremony. On Sunday, December 30, Unity of Stockton is hosting Anton Mizerk and Laura Berryhill performing a Musical Concert ~ “Shasta Song”. If you have never had an opportunity to hear their enchanting sounds, this is a chance to see, hear, and purchase their transformative recordings. I've been collecting these "Shasta Song" recordings for several years. I listen to them during meditation so often, that just to hear their harmonious vibrations of cymbals, chimes, flute, harmonica, keyboard, and harmonizing vocals place me in a zone of PEACE. We are celebrating our annual "Burning Bowl Ceremony" on December 30 with Anton and Laura providing musical inspiration during this life affirming event. 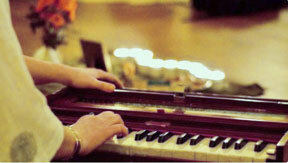 Consider joining us @ 10:00AM for vibrational musical meditation with Judy Wollam on the harmonium. Resinate with this sound as you begin releasing all that prevents your spiritual growth. "Burning Bowl Ceremony" prompts us to let go of what no longer serves our highest and greatest good, leading to Peace and Joy in the coming year. December is a festive month at Unity of Stockton. I look forward to it each and every year. Look for some of the events coming up in our December 2018 Newsletter. Christmas Advent is celebrated with candle lighting, music, potluck, and fellowship. We bake the ham and turkey. Will you bring a side dish? Sign up sheet is in the Social Hall. ​Every Sunday at 11:30 we offer coffee, tea & snacks after the Sunday morning talk. This gives us some time to get to know each other, check and and see how our Unity Family is doing and what's going on in our busy lives. ​Join us and get to know what it is about Unity that brings us together. ​Our kitchen angels who set up the food, make the coffee, and clean up afterwards, give us a warm and inviting space to connect! Thank you, Kitchen Angels! Plans have shaped up for a truly majestic Mount Shasta Retreat, August 10-12. Beginning Friday evening and carrying all the way to Sunday's spiritual conclusion, opportunities abound for a truly unique "Shasta" experience. Frank Thom, son of Kurak medicine man Charlie 'Red Hawk' Thom, will lead our Friday evening Drumming Ceremony. John Veltri and Marguerite Lorimer will join us, contributing their large Native American drum. Your own drums are a welcome addition to our drum circle! On Saturday, there are several offerings for relaxation within our 'forest therapy'. See the attached flyer below for a listing of the many activities available on Saturday. We're honored to have Certified Massage Therapist, Debbie from Stewart Mineral Springs, who is providing four one hour massages on Saturday. Her charge is $75/hr. You are coaxed to sign up soon, as two of her four sessions are already taken. You are encouraged to bring a dish to share for evening meal at 5 PM on Saturday. We will be carpooling to Shasta for the "I Am Pageant" at 6 PM. Admission to the Pageant is free. Check out the attached "Shasta Retreat" file below for a complete list of details on all of the planned activities for this weekend retreat ~ August 10-12, 2018. There are many books with the title, "Chop Wood, Carry Water". It is difficult to attribute this philosophy to any one of them. It is actually an age-old Zen story. This is the way I heard it. There was a master teacher and his student. A couple of his student chores were to chop wood and carry water. This student did these chores diligently everyday for many years. Why do I tell this story? Up here, wood is like gold. It is the main source of heat for people in the winter. However, you can’t wait ’til winter to prepare it. A friend of mine has a dad in his 90’s. She tells me he still splits his wood by hand. Incredible! As Esther and I settled in, furniture in place, food in ‘frig, and clothes put away, it came time to hang pictures. There are numerous pictures to hang, some of which will never be hung as leaning triangular walls do not lend themselves well to hanging pictures. There was one picture, however, I knew had to be hung. Bought on impulse many years ago, I did not realize its profound meaning at that time. This picture was the first to be hung and coincidentally ended up literally in the center of the cabin. “A picture speaks a thousand words”. I feel it speaks considerably more than that. This picture shows a thread connecting a wolf with a Native American with a dragonfly. The caption reads, “WE ARE ALL ONE FAMILY”. It’s true. We are all one Family ~ Unity is a beautiful thing! We often think of our connections to other humans and rarely to all else. We are also connected to the animals, to the insects, to Mother Earth herself. In fact, we are connected to the entire cosmos. We have a book and cards entitled, “Medicine Cards”, by Jamie Sams and David Carson, published by St. Martin’s Press, copyright, 1988, 1999. It’s the discovery of power through the ways of animals. Native Americans have whole clans dedicated to one of these animals. This book is dedicated to ‘Grandmother Twylah’ for her lifetime of service to the teaching of the Wolf Clan and the children of ‘Mother Earth’. The Wolf represents teaching; finding new paths and options; breaking through; being a role model and sharing inner knowing. At the moment, I identify with the Wolf. I say “at the moment” because I have experienced the impermanence of everything. I’ve been a turtle, a bear, and a butterfly and will likely be again. Esther identifies with the swan (grace) and the deer (gentleness). Those of you who know her will certainly testify to that! The dragonfly represents and confronts denials, breaks through illusions and honors inner truths. Honor your inner truths!!! The Native American represents living in harmony with Mother Earth, respecting what they take, taking no more than required, and giving back. We truly believe this. Why else would we choose to live where we now live? This is our inner truth.